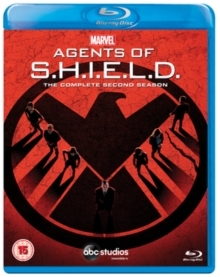 The second season of the action drama spin-off from 'Marvel Avengers Assemble' (2012). Clark Gregg reprises his role from the film as Agent Phil Coulsen, who runs an elite team for the Strategic Homeland Intervention, Enforcement and Logistics Division. Together these agents of S.H.I.E.L.D. must investigate and hunt down strange occurrences posed by new threats and a rising number of supervillains. The episodes are: 'Shadows', 'Heavy Is the Head', 'Making Friends and Influencing People', 'Face My Enemy', 'A Hen in the Wolf House', 'The Writing On the Wall', 'The Things We Bury', '...Ye Who Enter Here', 'What They Become', 'Aftershocks', 'Who You Really Are', 'One of Us', 'Love in the Time of Hydra', 'One Door Closes', 'Afterlife', 'Melinda', 'The Frenemy of My Enemy', 'The Dirty Half Dozen', 'Scars' and 'S.O.S. '.